Savvy Corrupt DOCX Recovery, automatically recovers corrupt docx files. The program automatically uses four different progressively more basic algorithms until the final method hopes only to recover text, no formatting. Docx files are in reality zipped collections of mainly concentrated in the document.xml file. If it is partially corrupt, for instance ending with inappropriate XML tags, Word will often not open the docx. Savvy Word Recovery will remove or reorder the corrupt xml from the document.xml, automatically add the correct ending tags if needed and try to open the resulting docx document with the possibly truncated text. If other xml files such as the styles.xml file are corrupt, Word will also sometimes also refuse to open the file. Savvy Corrupt DOCX Recovery knows to fix these ancillary to the main document.xml files as well. Afterwords, Word will often then be able to open the docx file. 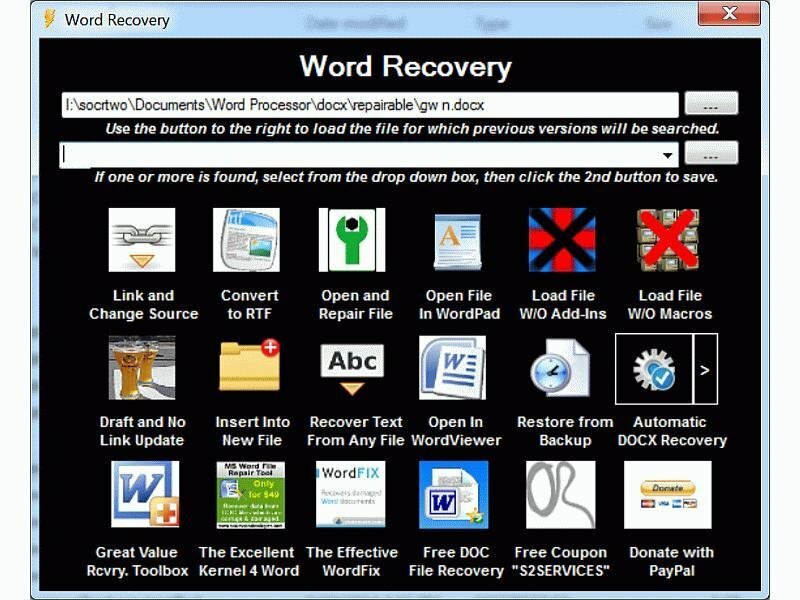 Finally the program also has a shortcut to the effective commercial program WordFix, made by the corrupt file recovery company with which I have the best affiliate relationship. WordFix and this program differs from Corrupt MS Office Extractor and Corrupt Office Salvager from below in that they are sometimes able to recover formatting as well as the text. I also do manual recoveries for $22 only if I succeed to your satisfaction. Microsoft has some recommended methods for recovering from PowerPoint presentation corruption here, http://office.microsoft.com/en-us/powerpoint-help/recover-a-corrupt-powerpoint-file-HA001116878.aspx. S2 Recovery Tools for Microsoft PowerPoint provides easy access to most of these, allowing them to be engaged with pushes of buttons. The program also adds four of its own independent methods. These independent methods include two text, slide and format recovering methods for PPTX files which repair all the salvageable underlying XML subfiles as well as the higher level conventional zip structure of these presentations. The program also has links to three major commercial solutions. One of these is a web service provided by Recoveronix', Online File Repair. With the provided coupon code, until Nov. 1, 2014, the service is free, a $39 value. : Perfect for online scripts and services needing text or data extraction from both corrupt or healthy docx, xlsx or pptx files. Coded by Ccy, author of HaHa Zip and using Delphi Zip, CMD Corrupt OfficeOpen2Txt will often recover text from corrupt "Office Open XML" format files where the respective Microsoft Office 2007, 2010 or 2013 programs cannot salvage the text or data. Office Open format files are zipped collections of XML files. There are two kinds of corruption of these types of files, zip structure corruption and XML corruption. This program deals with both. The unzipping module used in Office 2007 - 2013, is more finicky than DelphiZip module used by CMD Corrupt OfficeOpen2Txt. Thus the collection of files making up the docx, xlsx or pptx file can be extracted as raw material for data/text extraction in the programs 2nd stage. MS Office doesn't even get this far sometimes. In regards to XML corruption, the format is by design a very unforgiving medium for file damage. From the errors returned from attempts at salvaging the text from Office 2007 - 2013 it appears Microsoft is using a fairly standard interpreter of XML even when encountering corruption. CMD Corrupt OfficeOpen2Txt on the other hand does not get hung up by so call XML issues of "well formedness". : Corrupt PPTX Salvager is based on Pptx to Text converter by Sopan Shewale. This projects differs from Sopan's project because it starts with a zip repair step using the -FF repair command with InfoZip's zip.exe open source command line app and it uses a different unzipper. Corrupt PPTX Salvager uses 7zip, an unzipper that's relatively more impervious to zip corruption than PowerPoint's built in one seems to be. PPTX files seem to have zip corruption as their biggest cause of not opening. 7zip is able to extract the xml slide files from the pptx where PowerPoint 2007, 2010 and 2013 sometimes fail to deal with corruption. Furthermore Sopan designed Pptx to Text and PPTX Salvager uses regular expressions to extract the text from the XML slide files rather than the stricter XML reading routines that PowerPoint appears to be using. So sometimes when PowerPoint signals an unreadable XML error, this programs still extract useful text. If the program fails, try Recoveronix' Online File Repair service. It's free until 11/01/2014 with coupon code "S2SERVICES". : This program uses the same methods as Corrupt Office Salvager for recovering Open Office text and format. It will possibly recover some formatting for Open Office Files as by doing surgery on the styles.xml file. If that doesn't work it uses SilverCoder's DocToText to try to recover the text. If the program fails, try the Recoveronix' Online File Repair Service. It's free until 11/01/2014 with coupon code "S2SERVICES"! Starting with Vista, Windows allows the recovering of previous versions of files without a dedicated backup. These previous versions are stored whenever a Restore Point is made by the system or manually made by the user from the System Protection tab of the System App in the Control Panel. These previous versions can be recovered in Vista and Windows 7 by merely right clicking the target file and choosing "Restore previous versions." This feature is unavailable in Vista Home Home versions and all Windows 8, hence the need for this program. Previous Version File Recoverer works with the other versions of Windows Vista and Windows 7 too, so if you find it easier to use then right clicking on files in Explorer then by all means do so. Note, Previous Version File Recoverer rebuilds the index each time you invoke it which is time consuming. Windows however may also doing the same thing with its feature as the two apps take similar amount of time to work. The program may even work with certain versions of XP when on business networks where previous version recovery is available through a 2003 or later Microsoft Server installation. A similar program to this one is Shadow Explorer: http://www.shadowexplorer.com/. You might find that program better because it exposes previous versions of files in an Explorer-like interface, however Shadow Explorer may also be more work because you must look through each restore points file tree to see if the point's version of your file is the one you want. Previous Version Recoverer however does the work for you and simply presents you with a list of previous versions that are different for your corrupt one. Previous Version Recoverer looks at a previous version's size and date saved to determine if the version is truly different. In the end using Shadow Explorer may be more time consuming then using Previous Version Recoverer.